Announced in February 2013 at the CES in Las Vegas, the Sony NEX-3N is the replacement for the popular entry-level NEX-F3. 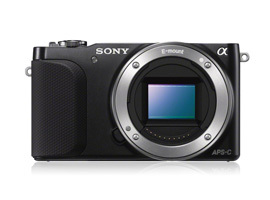 It adopts a 16.03M-Pix APS-C (15.6mm x23.5mm) CMOS sensor with sensitivity running from ISO200-16,000 but is unashamedly aimed at novices, adding several new features to entice those users from a compact stills camera. These include a powered zoom rocker switch on the body for the bundled retractable E16-50mm f/3.5-5.6 PZ kit lens (equivalent angle of view to a 24-75mm in 35mm full-frame terms). Not only is the lens more compact (when retracted) than previous offerings, it also features optical image stabilization. Although the previous iteration had a tilting rear screen, given for the fad for self-portraits, the NEX-3N sees a simpler hinge mechanism located at the top to provide more flexible viewing options. The (3.0-inch) LCD flips up and rotates 180-degrees allowing the photographer to accurately frame and compose shots of themselves and friends at arm’s length or otherwise. Like its predecessor a small built-in flash is included, but the NEX 3N does away with the accessory port, preventing the fitment of an optional electronic viewfinder, more powerful flash or even a stereo microphone further restricting the camera’s capability and flexibility. With this model and the recently introduced mid-to-high-end NEX-6, Sony is more clearly defining the NEX range; the NEX-5R being the next step up in price and capability with the on-chip phase-detection pixels embedded in the sensor for faster AF, while at the top of the range is the semi-pro oriented 24P-Mpix NEX-7, though the replacement for that model, presumably to be called the NEX-9 is now well overdue. 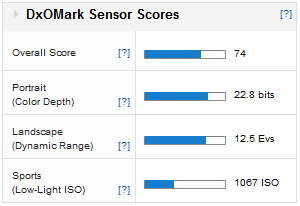 Just edging in front of its predecessor the F3, the Sony NEX-3N has a good Overall DxOMark Score of 74, ranking 46th for all sensor sizes in our database, and a healthy 6th place for ‘Hybrids’ overall. Each of the individual metrics show the sensor is very efficient and has a good balanced performance. A 12.5 Evs score for Landscape (Dynamic Range) places the NEX-3N 42nd overall, and 7th just behind the Samsung NX20 in the mirrorless ‘Hybrid’ category. A Portrait Score (color depth) at 22.8 bits is also a good score, placing 53rd out of every camera in our database and 6th for its type, one place in front of the Olympus OM-D. The NX-3N has of control of noise and narrowly avoids the 20dB threshold for SNR 18% at maximum sensitivity. 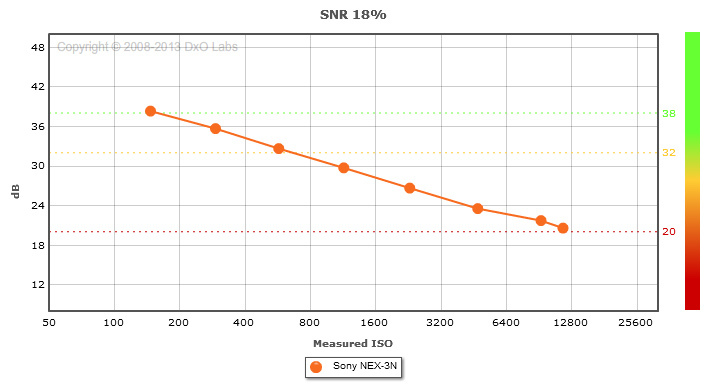 The APS-C sensor in the NEX-3N also has good control of noise with a 1067 ISO Low-light score. 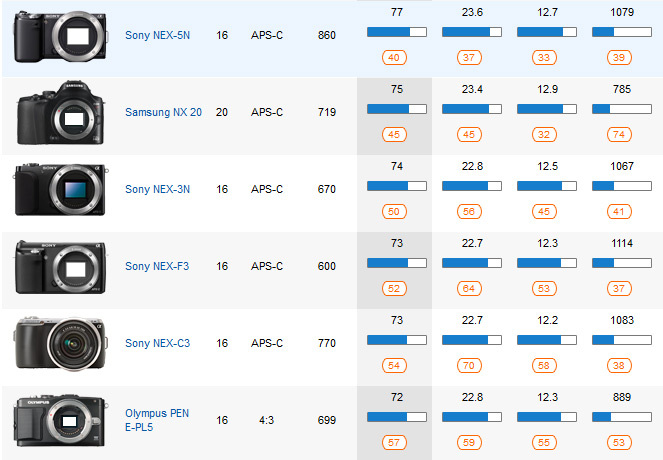 That puts it just ahead of the NEX-6 and NEX-7 placing it 4th in the mirrorless ‘Hybrid’ list and at 38th overall out of all the cameras tested. From this, there’s no doubt the NEX-3N is a capable performer, but on the downside, there are no performance gains over its predecessor. The main challengers to this particular category, stepping up from a compact camera, come from the smaller sensor cameras such as Nikon 1 system and the micro 4:3 format from Panasonic and Olympus. 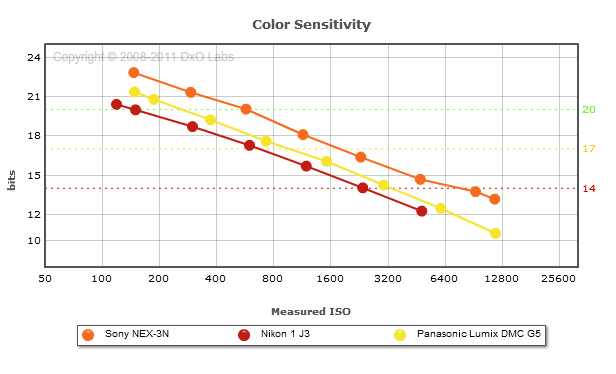 Against the new Nikon 1 J3, with a DxOMark Score of just 52, the NEX-3N has a clear advantage from the size (larger surface area) and light efficacy of the Sony-fabricated APS-C sensor. The same applies to the mid-range micro 4:3 Lumix DMC G5 (we’ve chosen that model over the entry-level G3 as it’s becoming difficult to find new). 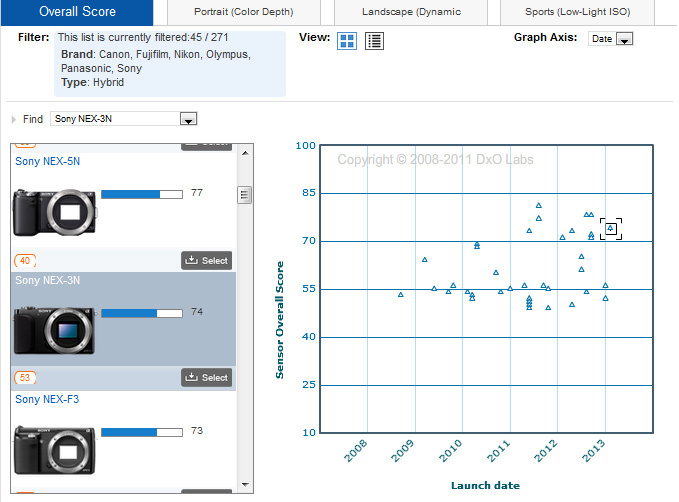 In every metric the Sony is ahead. 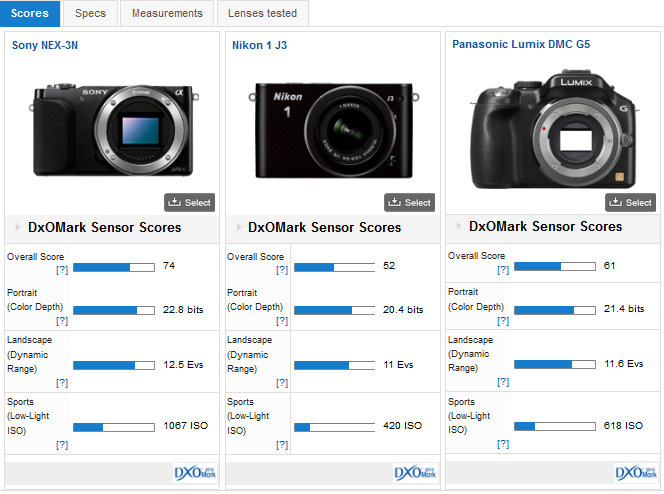 In the low-light scores the Sony has a 1 ¼ stop advantage over the Nikon and just over ½ a stop over the Panasonic. 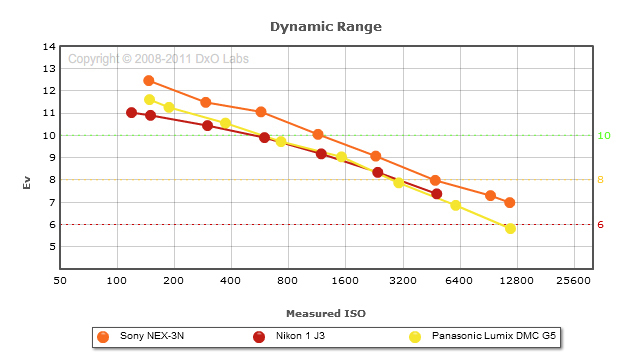 In the Landscape use category that we adopt to illustrate Dynamic Range, our measurements reveal a resounding 1.25 Ev improvement over the Nikon 1 J3 and a still sizeable 0.85 Ev gain over the Panasonic G5 (at base ISO), and that advantage continues over the whole ISO range. As for Color Sensitivity, with a color depth of 22.8 bits the Sony has around +1 1/3 stop advantage over the Nikon at 20.4 bits and +2/3 stop benefit over the G5, at 21.4 bits. In our second comparison, we’ve pitched the NEX-3N against its predecessor, the NEX-F3. 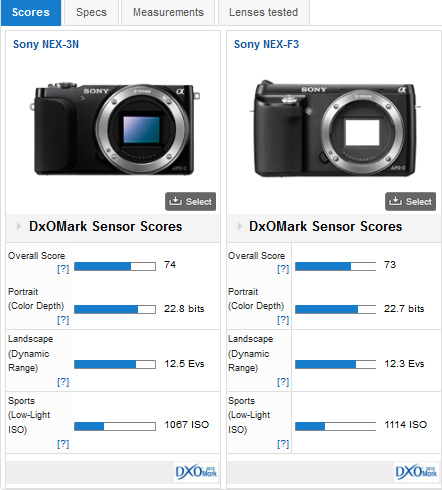 With color sensitivity recorded at 22.7 vs 22.8 bits and 12.45 vs 12.3 Ev for the Dynamic Range, the scores for all three metrics are close enough to say the two models adopt the same sensor. From our point of view looking at the sensor, the NEX-3N is somewhat disappointing, as there has been no advance in performance terms. However, from the consumers view, the sensor is an established unit and a high performer capable of great image quality. In that respect, the 3N can be seen as only a marginal or iterative update to the F3, but the competitive price, including the new compact, image-stabilized 16-50mm kit zoom, means the NEX-3N remains an appealing choice for beginners.